Be the first to share your favorite memory, photo or story of Harvey. This memorial page is dedicated for family, friends and future generations to celebrate the life of their loved one. Harvey E. Fields was born on December 7, 1932 in Big Stone Gap, Virginia to John W. and Devona Mae (Winstead) Fields. He married Phyllis Fleming on September 23, 1955. Harvey was an Army Veteran of the Korean Conflict, where he earned 3 Bronze Stars. He worked for 26 years at the Animal Disease Center and was at Iowa State prior to that. Harvey has lived in the Ames/Story City for most of his life. Havey was known as “Harvey the Clock Doctor” as he fixed many clocks over the years. He also enjoyed woodworking and stock car and Nascar racing. 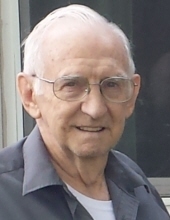 Harvey passed away January 22, 2019 at the Accura Health Care of Odgen at the age of 86. He is survived by his wife Phyllis of Boone; four daughters, Rhonda (Bradley) Starbuck of Nevada,IA, Valerie (Stephen) Gwiasda of Ankeny; Melodee (Michael) Correy of Story City and Cynthia (Tom) Reisinger of London, OH; seven grandchildren, Brooke, Nick, Paige, Olivia, Taylor, Kyle and Marrissa; a great granddaughter, Raelynn and a sister, Clara Casey of Florida. Harvey was preceded in death by his parents; five brothers, John, Howard, Ronald, Aultin, and Gerald; and three sisters, Barbara Jones, Dorothy Gregg and Thelma Giles. Family graveside services at the Story City Cemetery will be held at a later date. To send flowers or a remembrance gift to the family of Harvey E. Fields, please visit our Tribute Store. "Email Address" would like to share the life celebration of Harvey E. Fields. Click on the "link" to go to share a favorite memory or leave a condolence message for the family.